The theme for this month’s World on a Plate is picnic food, and I couldn’t be more excited. I’m representing the US in this global group, and picnic foods are some of the most quintessentially American. I’ve already posted about many of them, so I’ve created a little virtual All-American picnic for you, capped off with a recipe for my favorite mayo-free potato salad. It’s a bit more like a French potato salad in that it is essentially coated in a mustard vinaigrette instead of mayo, but I’ve always found the idea of normal potato salad sitting out in the heat to be unsavory. Pack your picnic basket – it’s a virtual picnic! This potato salad gets its brightness from lemon juice and a good zing from the Dijon mustard. It couldn’t be easier to put together, and goes well with every kind of picnic and barbecue main. On top of it all, it’s gluten free, parve, and vegan! This mayo-free potato salad is the perfect side for a picnic, and it only gets better after a few hours in the fridge or picnic basket. Put the potatoes in a pot and cover with cold water. Simmer over medium heat, uncovered, for 20 to 25 minutes, until tender. Drain and allow to cool slightly. Meanwhile, whisk together the olive oil, mustard, and lemon juice in a small bowl. Season with salt and pepper. Put the potatoes in a large bowl and toss with the vinaigrette and chives. Serve immediately or store in an air-tight container in the fridge for up to three days. 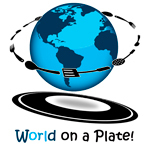 About World on a Plate: Started by Pola from Italian in the Midwest, World on a Plate is a purposefully small group that is all about cultural exchange. Each month we will have a theme (this month’s theme is picnic food!) and will post a recipe from our “home country” that fits the theme. We are currently nine bloggers who represent Germany, India, Italy, Korea, Malaysia, the Philippines, Sweden, and the United States (that’s me!). If you are interested in joining and see that your home country is not represented, give Pola a shout! This American picnic like a feast! Must be delicious! Wow that is a picnic!! I am a huge fan of potato salad but this cherry and mulberry pie looks AMAZING!! Wow, that looks terrific. And the photos are really top notch! I’m so glad you did a non-mayo potato salad – dijon mustard and olive oil is just how I like it – I tend to add a splash of apple cider vinegar in place of a bit of the lemon juice as well! Aren’t picnics wonderful things?! Me too! Apple cider vinegar is a great idea, I’ll have to try that next time. Picnics are the best! Love this idea! Can’t wait to see what is Picnic fare all over the world! Thanks Alyssa! It was a ton of fun. What an amazing post, lovely recipes! I love what a simple but international dish it is! And I totally agree, it’s perfect for a barbecue as well. 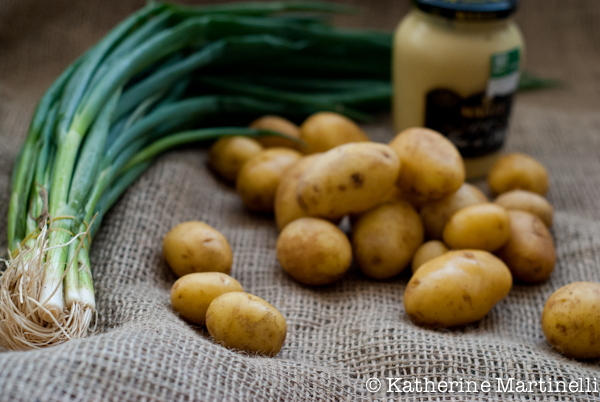 This is exactly the kind of potato salad that I love, dijon mustard is a perfect companion to potatoes. It really is the perfect pairing! This is a wonderful theme and perfect timing. You did a great job in deciding on what items to include in your picnic, these are the things I think of when I think about a picnic. I will need to come back and look into the details of these links. Your potato salad is such a welcome sight since I have always thought that most of them out there were too over loaded with mayo! Thanks for posting this and have a good day. Thanks Tina!! I love that this is what you think of when you think picnic as well. And I’m with you on the mayo-heavy potato salads – when it’s hot out I want something lighter! What a great picnic! I agree with you that I prefer the French idea of a vinaigrette dressing for my potato salad. Looks so delicious! Thanks! 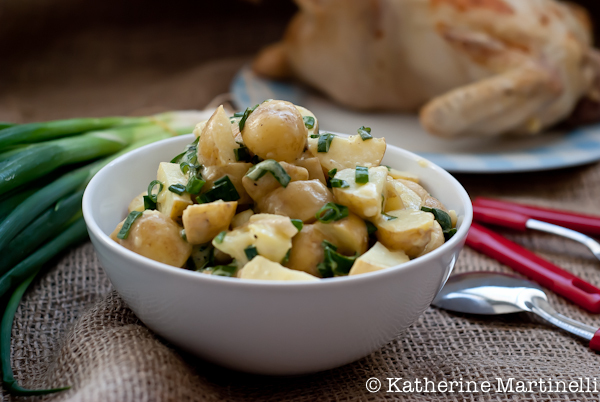 Potato salad is a simple and delicious side dish – I hope you try it soon! Potato Salad is one of my favorites! I can eat a whole bowl as a meal… it’s kinda gross! Yours looks amazing! Haha that’s awesome 🙂 Thanks Carrie! Wow, what a great event 🙂 I’d love to sample myself through all the dishes. Everything looks delicious! Would love to try your potato salad. It looks and sounds really good. Great theme! And the potato salad is a perfect fit. Your recipe is particularly nice – love the mustard in it. Great pictures, as always. Thanks for this. Thanks! Potato salad was one of the first things that came to mind when I thought about picnic food. 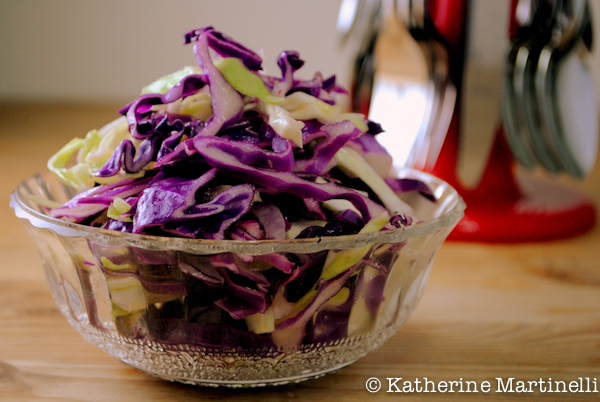 I love everything Katherine and today I;m going to make the light slaw! Thanks Eri! Hope you enjoy the slaw – it’s so easy and makes a great side, especially for heavy picnic food. What a delightful picnic menu! I do love this potato salad recipe. A very delicious picnic menu! Your potato salad looks delightful. What a great looking picnic basket! Can I come?! A potato salad without mayo – it’s about time! Looks wonderful! Wonderful picnic line up. So happy to see a mayo-less potato salad, looks delicious. Great post. I am never (and I mean never) attracted to cole slaw, but that photo looks really appetizing. And that chicken! This would be a picture-perfect picnic. Haha thank you! I actually don’t like traditional cole slaw either, which is why these fresh, light, mayo-free varieties really speak to me. I love potato salad and yours is perfectly delicious and simple looking, Katherine! Wonderful recipe. This potato salad is really different from all the other mayo styled ones. beautiful selection of picnic dishes! The only thing that’s missing is the blanket and the open space! Thanks Katerina! Yes, I wanted something a little different. Need to head out for a picnic soon! I love picnic food, especially potato salads! 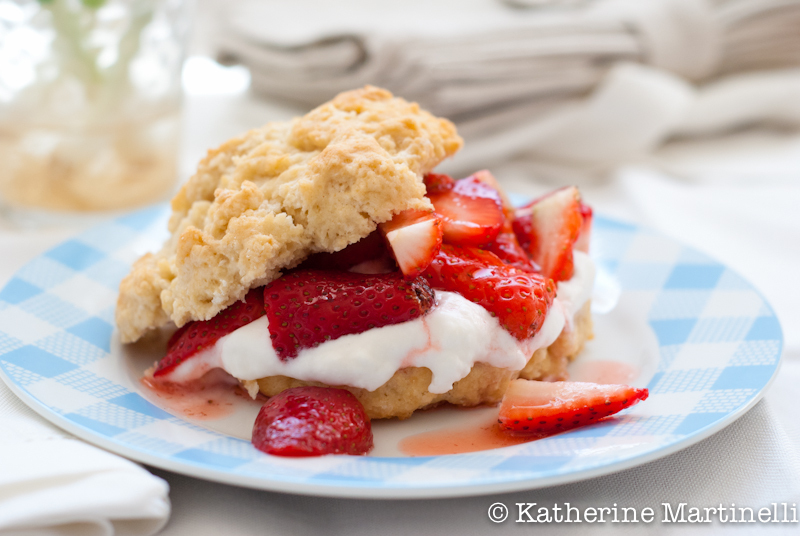 The strawberry shortcake looks ahh-mazing! Now that’s my kind of potato salad. I’m not a mayo girl – give me a mustard vinaigrette any day! This potato salad looks delicious.. just the kind which will make me so happy!!! As long as there are no virtual ants to go along with that. LOL That spread looks awesome! Looks outstanding, as usual!! Picnic season has finally arrived in Seattle and we couldn’t be more excited. Virtual picnic looks wonderful. I could eat all of it!!! I am all about second dessert lol. A virtual picnic that left me drooling on myself like a teething baby! WOW! Everything looks gorgeous! I wish I went for a picnic with you 😉 The potato salad looks fantastic too and I’m sure it tastes equally great warm and cold. Thanks! After this virtual picnic I’m ready for a real one 🙂 And the potato salad really is just as good warm as it is cold – my husband liked it even better the next day out of the fridge! Gorgeous photos and perfect picnic menu! I love it. So fun! I’m sure your picnic will be delicious – baked fried chicken sounds awesome! 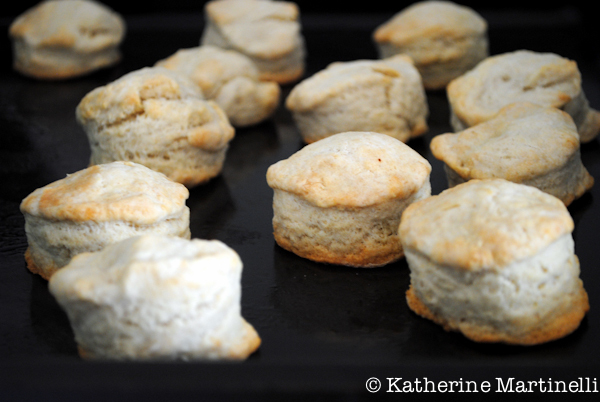 Oh, bring on the summer time picnics and pies, and biscuits,…and did I mention pies?? All of your dishes look so yummy. I ADORE anything with potatoes, and I love potato salad. I also think the way you’ve combined all of this into a virtual picnic basket is wonderful. I’m so glad to be in this group w/ you! Me too!! I wish we could all go on a REAL picnic together 🙂 What fun we would have! Mustard potato salad is my favorite kind – I just love the tang with the soft potatoes. It’s like heaven in picnic form! I drooled over this potato salad in the Top 9. Simply beautiful! And if I could design a picnic, this is exactly what I’d have! I want to go to a picnic with you – you bring food and I bring drinks and appetite! LOL!!! Very nice complete meal! Also from the comments above, you seem like you were on Top 9! Congrats!!! Nami I’ll have to come to SF and we’ll have a picnic 🙂 And yes, was in the Top 9 yesterday – thanks!! I really enjoyed your virtual all-American picnic! Your no mayo potato salad looks so good. I’ll have to try it. That strawberry shortcake is definitely calling my name. Great picnic post! Looks great for a summer picnic or bbq. Very nice! mayo free potato salad? u r not kidding right? I’ll have to try these recipes. I have fond memories of eating fried chicken at the beach growing up. Perfect picnic food for some reason lol. I was always in love with the mustard potato salad in the plastic tub at the grocery store (pre nourishing foods transformed diet years ago lol). I never thought to make potato salad myself!!! Someone once said, whatever you do don’t become known as the person who makes the best potato salad. 😀 probably bc peeling the potatoes is such a pain?